Experience the beauty of the Cummer Gardens in an entirely new way. The interactive Garden Tour for Tablets features beautiful photos from the Gardens and intriguing facts about its plants, sculptures, and landmarks. 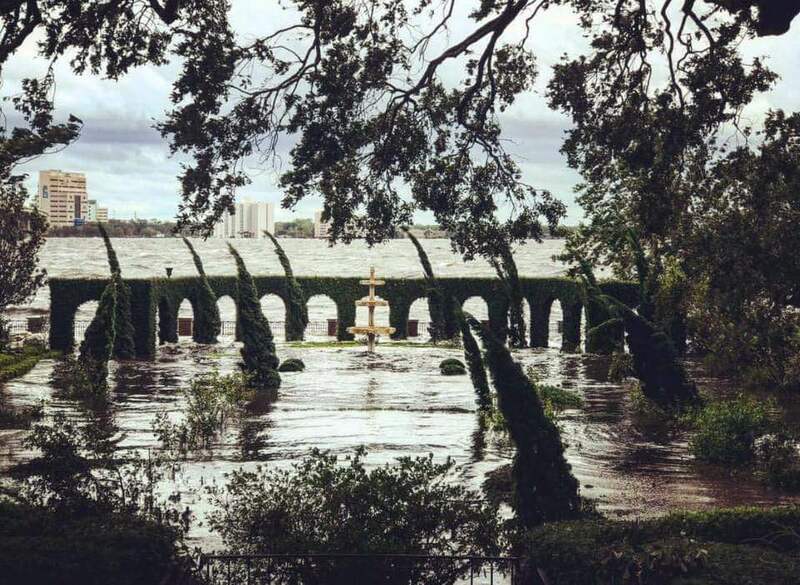 The Cummer Gardens were severely impacted by Hurricane Irma. Members of the community may learn more or donate directly to the Garden Reconstruction Fund through the link below. Donations to the Garden Reconstruction Fund are fully deductible to the extent allowed by law. The Cummer Museum of Art & Gardens in Jacksonville boasts some of the most important and delightful gardens in Northeast Florida. Idyllically located on the banks of the St. Johns River, the Gardens have a fascinating history stretching back more than 100 years and bear the imprint of some of the foremost names in landscape design and horticulture, including Ossian Cole Simonds, Ellen Biddle Shipman, Thomas Meehan and Sons, and the fabled Olmsted firm. The involvement of these prestigious firms gives national importance to the Cummer Gardens. Throughout the year, the gardens are ablaze with rare horticultural specimens nestled under a canopy of mature live oak trees. In addition to the lush plantings, features such as reflecting pools, fountains, arbors, antique ornaments, and sculptures help create a special outdoor space that provides a perfect complement to the Museum's Permanent Collection. The Gardens were created by one of Jacksonville's most prominent families, who settled in Florida in the early 1900s. Arthur Cummer and his brother, Waldo Cummer, came from a long line of Michigan lumber barons. They built their homes on either side of their parents, Ada and Wellington Cummer, on the banks of the St. Johns River. The brothers led the Cummer Lumber Company while their wives, Ninah Cummer and Clara Cummer, masterminded the gardens surrounding their homes. Those gardens are now one of the glories of the Museum and are listed in the National Register of Historic Places. Adapted from A Legacy in Bloom: Celebrating a Century of Gardens at The Cummer by Judith Tankard, available for purchase through the Cummer Shop. In the early 1930s, Waldo and Clara Cummer inherited the majority of Ada Cummer’s estate upon her death. They engaged William Lyman Phillips, a partner in the Olmsted Brothers firm, to incorporate this new property into their existing gardens. These gardens were partially obliterated in the early 1960s, when both Cummer homes were demolished to make way for a new museum building to house Ninah Cummer's art collection. This property was purchased by the Cummer Museum in 1992, and a full restoration, which relied heavily on archival material from the Olmsted Brothers firm as well as historic Cummer family photographs, was completed in 2013. The Olmsted Garden features areas named by Linda Roe Alexander and Sandra Roe Smith, Ann and David Hicks, and Monica and Bob Jacoby. Upon the completion of their Tudor-style home in 1903, Arthur and Ninah Cummer engaged Michigan-based landscape architect Ossian Cole Simonds to create the first plan for their estate. Simonds’ initial scheme, with naturalistic sweeps of native trees and shrubs, enhanced the stands of majestic live oaks along the riverfront property. These plantings provided the backbone for later development. In 1910, the Cummers decided they needed a new infusion of advice, so they turned to Philadelphia nurserymen Thomas Meehan and Sons. Meehan and his team created the basic design configuration that exists today. Rectangular in shape, with beautifully-laid brick paths alternating with grass walks, this garden space was first known as the Wisteria Garden in honor of the striking semicircular cypress-beamed pergola overlooking the St. Johns River. In later years, Ninah infused the space with azaleas and renamed it the Azalea Garden. Today it is known as the English Garden. The jewel in the crown of the Cummer Gardens is the Italian Garden, one of only a handful of extant gardens designed by Ellen Biddle Shipman. Designed in 1931 on the site of Arthur and Ninah Cummer’s former garage and a portion of Ada Cummer’s estate they inherited following her death, this garden was conceived as the ultimate display garden for Ninah’s large collection of Italian marble garden ornaments and hundreds of azaleas. Two long reflecting pools frame the view to the green, ficus-covered gloriette that resembles the famous water gardens at the Villa Gamberaia in Tuscany. These gardens reached their apogee in the late 1930s, when they were ablaze with hundreds of azaleas set amidst a stunning collection of garden ornaments. Shipman’s name slipped into obscurity, only to resurface in 1998 when a set of Cummer Museum plans and blueprints was discovered in the designer’s archives at Cornell University. The discovery spearheaded a full-scale rehabilitation of the Italian Garden. In 2013, the Cummer Museum completed a major campus-wide landscape and beautification project that culminated in the creation of the J. Wayne and Delores Barr Weaver Community Sculpture Garden, located in the front lawn of the Art Connections building. The Sculpture Garden features four permanent installations from the Cummer Museum’s Permanent Collection: William Zorach’s Spirit of the Dance; Sir Jacob Epstein’s Seventh Portrait of Kathleen; Archie Held’s Lovers; and Takashi Soga’s Sea of the Ear Rings. In addition to these permanent pieces, the Sculpture Garden hosts one temporary exhibition each year.